Bubba Watson shows his winning form on the 18th hole during the final round of the Travelers Championship at TPC River Highlands in Cromwell, Conn.
Bubba Watson overcame a six-stroke deficit Sunday to win his third Travelers Championship title, shooting a 7-under-par 63 for a three-stroke victory at TPC River Highlands in Cromwell, Conn. The lefthander became the first three-time winner on the PGA Tour this season and pulled within one of Billy Casper’s tournament record of four victories. He finished at 17-under 263. Third-round leader Paul Casey, Stewart Cink, Beau Hossler, and J.B. Holmes tied for second. Casey shot 72, Cink 62, Hossler 66, and Holmes 67. During the victory ceremony, Watson’s children — 6-year-old son Caleb and 3-year-old daughter Dakota — received small trophies of their own. Watson shot a 33 on the front nine, but really got it going on the back, with five birdies. He tied Casey at 16 under by getting up and down from the bunker for a birdie on the course’s signature 15th hole. Still tied on the par-4 18th, Watson hit his tee shot 366 yards, then pitched inside 3 feet before taking the lead with the birdie putt. 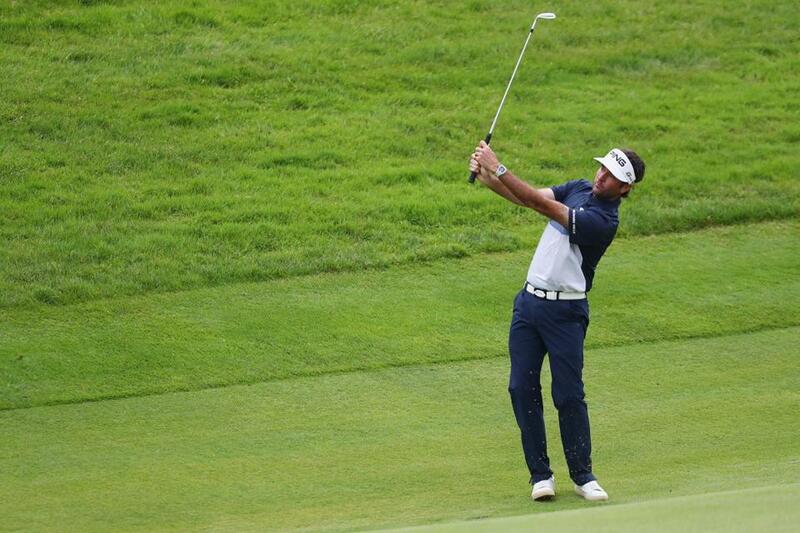 Casey, who shot 65, 67, and 62 to lead the field by four shots coming into Sunday, birdied his opening hole. But he gave that back on the fifth and had back-to-back bogeys on 16 and 17 to end any chance he had of catching Watson. Watson earned $1.26 million and a 500 FexEx Cup points, moving him into third place in the standings. LPGA — Japanese teenager Nasa Hataoka ran away with the NW Arkansas Championship for her first LPGA Tour title. The 19-year-old won by six strokes, closing with an 8-under 63 at Pinnacle Country Club in Rogers, Ark., for a tourney-record 21-under 192 total. She broke the mark of 18 under set last year by So Yeon Ryu. Hataoka won twice late last year on the Japan LPGA and has finished in the top 10 in five of her last six LPGA Tour stars, including a playof loss in the Kingsmill Championship last month. She began the round tied with Minjee Lee for the lead. Austin Ernst shot a 65 to finish second. Lee and third-ranked Lexi Thompson topped the group at 13 under. European — England’s Matt Wallace shot a 7-under 65 to hold off a record-breaking charge from Thorbjorn Olesen and win the BMW International Open in Cologne, Germany. Wallace finished at 10-under 278 — one ahead of Olesen, Mikko Korhonen, and Martin Kaymer. Olesen had played himself into contention with a 61, the lowest round in tournament history. He had nine birdies and an eagle. It was the lowest round of his European Tour career, and it gave the Dane a three-shot lead before the final group had even teed off. Wallace turned in 34 but then made five birdies in seven holes from the turn to edge a shot past Olesen. He waited as Kaymer and Korhonen went got with rounds of 68 and 67, respectively. England’s Aaron Rai and Denmark’s Lucas Bjerregaard finished tied for fifth with rounds of 69. Champions — Scott McCarron won the American Family Insurance Championship in Madison Wis., closing with an 8-under 64 for a one-stroke victory over Jerry Kelly. The 52-year-old McCarron birdied holes 14 through 16 and parred the final two to hold on for his first victory of the season and seventh in three years on the PGA Champions Tour. He finished at 15-under 201 at University Ridge.